As BlackBerry 9720 leaks again, should we expect the A10 to sport a 5" screen? The BB7 9720 out in the wild again? Is BlackBerry about to jump into the era of 5-inch smartphones with its rumoured flagship A10 handset? The report said the device, codenamed Aristo, 'closely resembles a Samsung Galaxy S4', with rounded, softer edges than the rather rigid Z10 touchscreen handset launched earlier this year. The A10 will apparently pack 2GB of RAM, however concerns over battery life and compatibility with the BB10 software will keep the processor at dual-core rather than making the leap to quad-core. A focus on gaming is also predicted, with the Canadian company working hard to ensnare developers to boost its app store offerings. 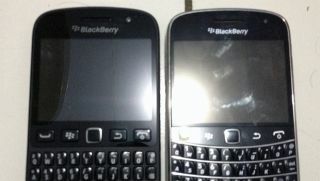 BB7 to live on with 9720? Beyond the A10 proclamations, the site also brought another purported snap of the BlackBerry 9720, the rumoured refresh of the iconic Bold 9700 device. The new pic, shown next to the 9700, presents a revamped styling that looks a lot like the recently-launched BlackBerry Q5 budget QWERTY handset. As we reported yesterday, the 9720 is newsworthy due to the company's plans to offer the handset running the BlackBerry 7 OS it's trying to move away from as it establishes BB10. On Tuesday, a BlackBerry spokesperson confirmed to TechRadar: "We intend to launch one additional product this year to support the BlackBerry 7 segment." BlackBerry CEO Thorsten Heins thinks tablets will be dead by 2018. Do you agree?